Here is a simplified explanation on how the systems work in changing water into Hydrogen and Oxygen. Let’s start with the water, it should be at least filtered or distilled and a gallon is about the best amount to have prepared for your HHO generator. 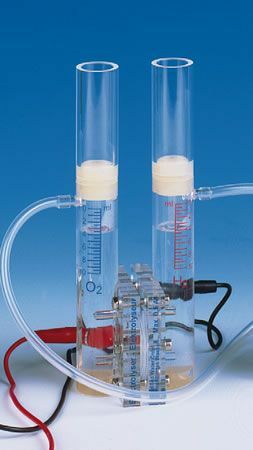 We call it an HHO generator because it produces both Hydrogen and Oxygen simultaneously thru the process of electrolysis. When water is introduced with electrical current/voltage [preferably DC] it has a tendency to become excited and divides into its primary elements of Hydrogen and Oxygen. The produced Hydrogen and Oxygen are now in a gaseous state from the liquid water. It's been said by others that the two elements have been split apart from one another into their sub-diatomic molecular state. A fallacy out there is that it takes more energy to produce the HHO than the energy it releases. Not at all true, that's why there are HHO generators available out there. You can produce HHO with as little as 1.5 volts DC and an amp of current. It's not only how it's done but the way in which the HHO generator is configured to permit a useful out put with minimal power input. You can put 2 bare ended wires into a bucket of water with an electrolyte and produce a small quantity of HHO by putting a DC current through the wires. The principle is to produce as much HHO as possible with the least amount of electrical energy and generated exothermic heat. In reality, once the HHO generator has been charged up it actually acts like a wet cell battery. It holds a charge of 1.5 - 2.0 volts DC and can operate when charged with the power switch turned off, until the remaining suspended HHO gas is pulled off and the cell ultimately discharges. The power switch is primarily used to maintain the HHO generators charge. What we do here is draw off that produced gaseous material by vacuum created by the vehicles engine and feed the gasses directly into the engine for combustion purposes. The system is an on demand system, "NOT" a pressurized storage system the HHO generator only produces what the vehicles engine may call for, nothing more. Can we idle an engine on pure HHO, the answer is absolutely, but to actually operate the vehicle under normal driving conditions the current technology is not quite there yet. Currently most of our users see from 25 - 45% on average concerning fuel savings. But don't think it stops there; the NEW Magnum Series HHO generators are pushing the fuel savings into the upper 50% range. If we keep on working on the problems that hold us from using just HHO long enough we will reach that point where the vehicles fuel tank will become a water reservoir tank for holding just water. The process is as follows, you start with water and an electrolyte, there are many different types. You add DC current, the H2o breaks down into H2 & O [we just call it HHO]. We introduce it into the engine by use of the engines vacuum. The HHO combines with the gasoline and air in the combustion chamber and is burnt. Once burnt, it converts back to H20 [water]. Its now going to absorb the inner heat from the engine normally at 350 - 450*F CHT and turn into super heated DRY steam. Then its pushed out during the exhaust stroke and out the tail pipe. There it condenses back into to water vapor and eventually collects back into water. So you start with water and end with water. "THE MOST AMAZING PART OF THE PROCESS IS THAT THE EMISSIONS ARE REDUCED TO EXCEPTIONALLY CLEAN LOW LEVELS". So what are our results, first and foremost a really ODORLESS CLEAN EXHAUST. Lowering HC,Co,Co2 and No2 emissions to almost to 0, In short the exhaust emissions drop off the scale as you know them and you produce water vapor from your vehicles tailpipe. Why vapor instead of water??? Because the hydrocarbon fuel [gasoline] produces enough heat during combustion to keep the burnt HHO in a water vapor state, so it will totally condense into water outside of the exhaust system [eliminating any internal corrosion]. Now you're going to ask, why don't the auto builders or other big corporations utilize this basic technology??? Well, its against their business model, if I can sell you an automobile that runs on inefficient fuel loaded with all sorts of emmission devices and promise you better mileage next time, and you haven't any other choices, what are you really going to do? Why is it that the auto builders have to be mandated to improve vehicle mileage? Because they are in bed with the oil producers and the lot of them are in bed with lobbyists and big banking. Here is a little tid bit of knowledge for you... This technology, has been around since the middle 1800's. YES THATS RIGHT OVER 100 YEARS!!! Back before the take off of the industrial revolution and the real use of oil and coal to power our factories and vehicles. But oil and coal was easier technology and easily found and CHEAP. GUESS WHAT "NOT ANY MORE"! So if you could gain performance, better fuel efficiency, smaller bills at the gas pump and BE GREEN TOO. WOULD YOU DO IT??? Whether you purchase our HHO systems or go to a competitor's store or website and purchase theirs. Just as long as you the consumer realize that you have been methodically led into a money pit concerning energy and fuel. SO NOW, WHAT ARE YOU GOING TO DO ABOUT IT?? ?